This Sunday I was chatting with a friend at church about Hawaii. I'm in love with Hawaii. I've only been once, but I cannot wait to return! One day I'll get back to Maui, and when I do I want to finally make it up the mountain in Haleakala National Park then bike down it. My friend had done this once, so she began sharing her experience, and friends, all I could hear as she told me her story was...God. You see, she started up the mountain in a van in the predawn darkness. At the top, they put her on a bike. 6700 feet in the air, a sheer drop to the side, and a decline that promised to move the bikes at a high rate of speed. The instructor gave them all a lesson on how to literally ride their enhanced brakes the entire way down the course and to stay in a line. The van tagged along in case at any point someone wanted to ditch their bike and climb inside. Well, my friend decide to ditch that bike before even trying. Her legs shook. Her brain froze up. As she stared at that mountain, she convinced herself she couldn't conquer it before even starting. Then the instructor stepped in. He coaxed her into believing that if she simply began, she would see she could finish. He changed her location in the line-up so that she was right behind him, and he told her to keep her eyes on him and nothing else. She agreed to give it a shot. Then the most incredible thing happened. They started down the mountain with all its twists and turns. As light began to spill into the darkness, she could just make out the instructor in front of her. Do you know what he was doing? His body and bike sped forward, but his entire focus was turned around, facing her as he navigated the trail without looking at it. He called out the turns that were coming, spoke words of encouragement, and helped her through every spin of her pedal. Her eyes remained on him. She didn't look to the left or the right, didn't think about what was coming, she trusted him to tell her and simply followed. That was how she made it down the mountain. Friends! That is a picture of our God! Yes, in Christ we can speak to the mountain to move, but sometimes that happens through him taking us up and over our mountains so that it moves into our past. He enables us to conquer it! And he does that with his eyes on us the entire time. He doesn't need to look at the path because he already knows it. I just LOVE that! He's not concerned with what's ahead, he's concerned with bringing us through it. He's concerned with us. So he keeps his focus on us, coaxing us through, speaking words of truth and love, empowering us to finish what we thought we couldn't even begin. Don't stop before you've even started. That mountain may look huge. You may wonder how on earth you can ever endure it. You may even be quaking in your boots and worried that you'll crash and burn. All you have to do is fix your eyes on him and follow his voice. 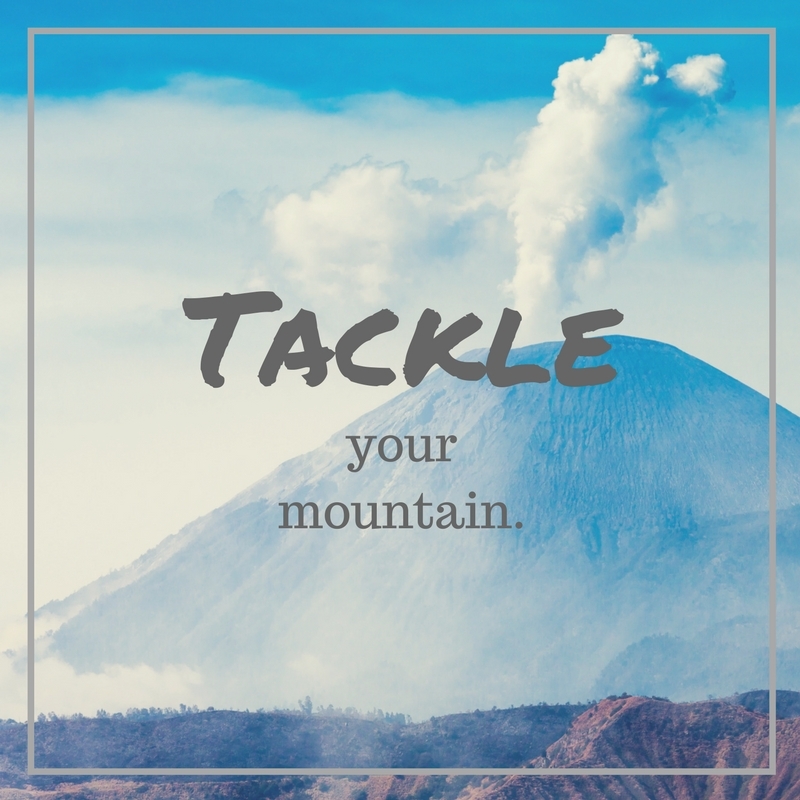 He's waiting for you to tackle your mountain with him leading the way.